This painting depicts a St. John’s Day eve in the Brazilian town of Ouro Preto, whose central plaza is illuminated with colored lanterns to mark the end of the winter solstice. Lincoln Kirstein commissioned Guignard to make the painting after seeing a drawing of the same subject. His description of the artist’s work — “tight and detailed’– characterizes much of the art that Kirstein favored. Guignard’s meticulous craftsmanship and attention to particulars are visible in this works finely rendered architectural features, tiny revelers, and distinctive indigenous flora. 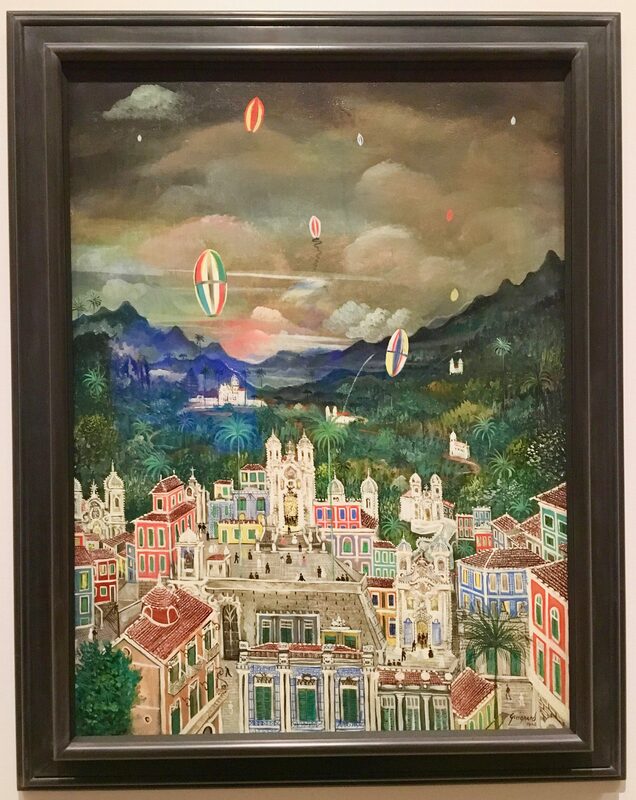 Ouro Preto: St. John’s Eve (1942) by Alberto da Veiga Guignard was photographed as part of the exhibit Lincoln Kirstein’s Modern, on View at NYC’s Museum of Modern Art Through June 15th, 2019. ← Pink Thing of The Day: Piglet Made Of Flowers!